Jamie says: Happy New Year! I can’t believe 2009 is almost over. It was a great year. I just want to say thank you to everyone who has ever read our blog. It’s so wonderful to have readers who enjoy following our food adventures. 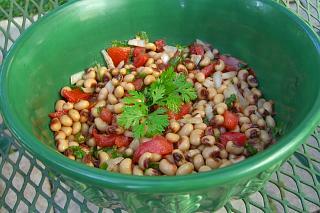 For a lucky 2010, I decided to make a black-eyed pea recipe for our New Year’s Eve party tonight. My family has never really been into the black-eyed peas for the new year tradition, but for some reason I embraced it this year. Here’s the recipe I came up with: two 15.5 oz cans black-eyed peas (drained), 1 medium tomato (diced), 1/3 cup fresh cilantro (chopped), 1 tbsp extra virgin olive oil, 1/4 tsp sea salt, and a dash of pepper. Chill in the refrigerator and serve alone or with corn chips. I had a spoon or two already, and it’s wonderful. The fresh cilantro is key; it adds a garden-fresh flavor. Nutrition note: Most people can use some more vegetables in their diet, and beans can be a good meat substitute, too. 1/2 cup of black-eyed peas has 4 g of fiber (17% Daily Value), 8 grams of protein, and 10% of the Daily Value of iron- all for 110 calories. I wish you all a happy and healthy 2010! Jamie says: Dad absolutely loves homemade banana bread. 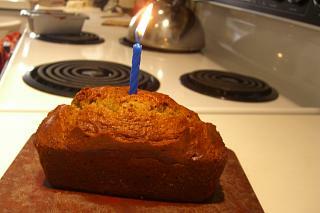 I really surprised Dad this morning by singing happy birthday to him while I held a mini loaf of banana bread with a candle in it. (His birthday isn’t for another 3 weeks.) The bread was warm and delicious- definitely a repeater. I modified a banana bread recipe I found from the Food Network (http://www.foodnetwork.com/recipes/tyler-florence/banana-bread-with-pecans-recipe/index.html). I used 1 stick of butter (equivalent to 1/2 cup butter) and 1/4 cup of Mott’s Apple Sauce (instead of the recommended total of 3/4 cup of butter). I also used 1/2 cup chopped walnuts (instead of pecans). I omitted the confectioners’ sugar and added 1/4 cup Craisins. I put some of the mix in a mini loaf pan and the rest in a 9 by 5 inch loaf pan. I baked the mini loaf for about 35 minutes, and the big loaf for about 1 hour and 20 minutes. (I would try the recommended 1 hour and 15 minutes next time). We all enjoyed the mini loaf this morning. I put the big loaf in the freezer so that Dad can think of me and enjoy the banana bread on his real birthday. Nutrition note: To reduce the fat and calories in a recipe, you can substitute apple sauce for butter. It’s still moist and flavorful, too! Jamie says: Merry Christmas! I am so thankful for all of the many blessings in my life, especially my wonderful family. I have been enjoying all of the family holiday festivities. Last night, we had a beautiful Christmas Eve party at our house, too. Nutrition note: When cooking with eggs, don’t dump the yolk. Just go easy on the amount of eggs you eat. Although the yolk does contain fat and cholesterol, it has many important nutrients in it, such as vitamin D and vitamin E.
Jamie says: I remember my Mother making a delicious pecan cookie with confectioner’s sugar and jam. When I asked her about it, she told me those were two different cookies. I guess I combined two good memories into one. So, I asked my mom for the pecan cookie recipe and decided I would try adding jam to it. The recipe, titled Pecan Puffs, actually came from my Mom’s neighbor in Brooklyn, New York. I slightly modified the recipe. I preheated the oven to 325 degrees Fahrenheit. I then beat 1 stick of butter until it was creamy and then beat in 2 tbsp sugar and 1 tsp vanilla extract. I measured 1 cup of pecans and then ground them in a blender. Next, I measured 1 cup all-purpose flour, 1 tsp baking powder, and 1/2 tsp salt into a sifter. I added the ground pecans to the butter mixture followed by the ingredients in the sifter. I stirred the ingredients together until they were well-mixed. I then spooned balls of the dough onto greased (using PAM Cooking Spray) baking sheets. I made a thumb print in the middle and Kathryn filled them with strawberry jam (not recommended for future baking). I baked them in the oven for about 40 minutes. The recipe made about 1 1/2 dozen cookies. (I guess I make big cookies because the recipe said it would make double that amount.) When I took them out of the oven, the jam had exploded (spilled out onto the baking sheet). 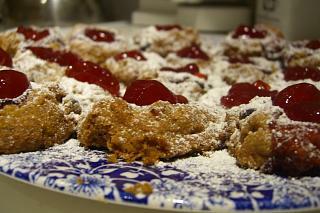 I then put the cookies on a plate and sifted confectioners’ sugar on top. I then added more jam (because there was virtually none left in the cookie) on top. (Next time, I would bake the cookies with a thumb print in the middle without the jam, then add the confectioners’ sugar followed by the jam.) Despite the mess, the cookies were so delicious. They were moist, buttery, and sweet. They look really festive, too. Nutrition Note: Try freezing cookies and sweets. They last a lot longer (months) than storing them at room temperature. They are also out of sight, which makes them easier to enjoy in moderation. And you won’t feel like you have to eat them soon because they will spoil. Kathryn says: Are there any vegetables you just can’t come to terms with? That was me with cauliflower. I was never a fan of the taste. But J likes it, and since we cook together a lot, it gave me a good reason to keep searching for a way to enjoy it. I’m happy to report a success story: mashed cauliflower. 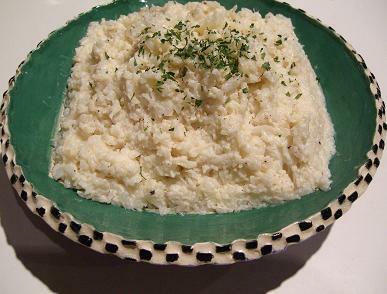 Once you mash it, the vegetable takes on a whole new texture – that of risotto (creamy rice), which I love. I found this recipe on Women’s Health Magazine’s Web site, and it was quick and tasty. I boiled a head of cauliflower until it was soft, drained it, mashed it with a potato masher (a fork would suffice), added garlic powder, fine sea salt, cream cheese, and butter, and kept mashing until it was all mixed. I sprinkled dried parsley on top for presentation. I liked it enough to get seconds! I won’t be cringing next time J suggests cauliflower for dinner. Jamie says: It was nice- all us ladies were in the kitchen together creating our own dishes for dinner. Mom was working away preparing a delicious pork recipe with orange marmalade and mushrooms, Kathryn was experimenting with a mashed cauliflower recipe, and I found some yellow squash in the refrigerator to work with. I quartered the squash and drizzled extra virgin olive oil on top. I minced up some fresh garlic and sprinkled sea salt, dried parsley, and dried rosemary on top; and into the oven it went with Mom’s pork roast. Our dishes came together nicely. I enjoyed looking at our Christmas tree all lit-up and dressed-up during dinner. Nutrition note: Try to eat a variety of vegetables. There are 5 vegetable subgroups- dark green, orange, beans & peas, starchy, and other. The different subgroups offer different nutrients important for good health. 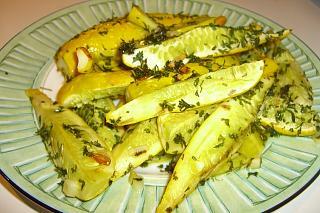 Squash falls into the other vegetable subgroup. 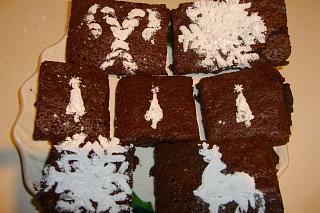 Jamie says: Holiday baking can be so much fun. When we were younger, Kathryn and I used to bake dozens of cookies with Mom and Aunt Angi for an annual Mother-Daughter cookie exchange. We would bring home all sorts of different cookies. This year, I felt like having a similar variety of treats. 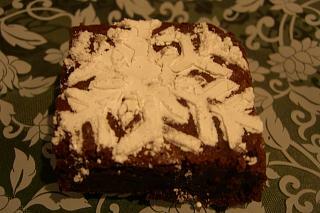 The first dessert I whipped up was Mocha Brownies- or Let It Snow Brownies- as I would like to call my modification of the recipe. My Mom introduced me to this recipe from the Williams-Sonoma Picnics and Tailgates Cookbook. First, I preheated the oven to 350 degrees Farenheit. 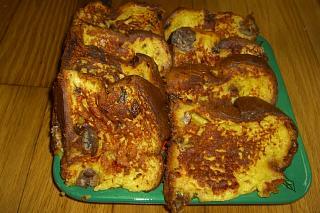 Next, I melted 3/4 cup Smart Balance Buttery Spread and 4 oz unsweetened Baker’s chocolate in the microwave. In a medium-sized bowl, I dissolved 2 tablespoons of instant coffee in 1 tablespoon of very hot water. I then added the chocolate-butter mixture to this bowl, along with 2 cups of sugar, 4 eggs (I realized I only had 2…thank goodness for good neighbors), 1 tsp vanilla extract, 1 cup all-purpose flour, 1/2 tsp baking powder, and 1/2 tsp salt. I mixed this using a rubber spatula. I baked for about 30 minutes (toothpick should come out clean and brownies should be fudgy), allowed the brownies to cool, and then sliced 24 brownies. I then used Martha Stewart Cupcake and Cookie Stencils and spooned confectioners’ sugar on top to make the pretty holiday designs. They were delicious and really quite pretty. My favorite design was the snowflake! Nutrition note: Be conscious of portion sizes, especially of sweets. One of these brownies contains about 180 calories.